The new iPad has officially been out for a week. We told you about some hot cases and must-have accessories for the new iPad, and the Nest by Bluelounge ($14.95) is one of them. The Nest works as a valet for your small items (keys, USB drives, etc.) while also serving as a stand for your iPad. The outer rim of its "bowl" area is rubber-lined, allowing a sturdy grip on your iPad while providing a comfortable typing position. The rest of the Nest is made of a hard plastic. Flip the Nest around, and you'll find a slide-out tray that can hold your iPad (or iPhone) in either portrait or landscape position. The Good The Nest is extremely versatile and does its job well. 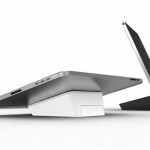 Using its slanted top for typing feels very comfortable, while the rubber prevents any unwanted movement of your iPad. When using the slide-out tray, the Nest essentially disappears from view. 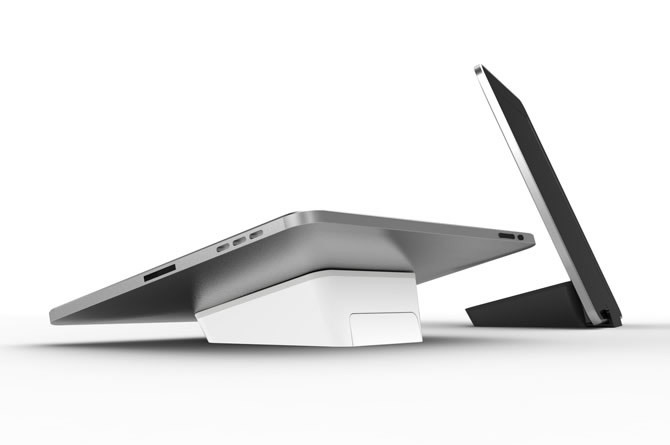 The tray is also wide and low enough to use your iPad while docked without worry of it slipping out or falling. The rubber feet on the Nest's bottom perform well at keeping the whole thing from sliding around. The Bad The inclusion of rubber lining on the edges of the slide-out tray would have been nice. There isn't any danger of it scratching your device or letting it slip, but it seems strange to add rubber to the entire top of the Nest while leaving the tray bare. Also, it is a tad difficult to access your iPad's home button while on the tray. The lip barely goes over the bottom edge. You can easily put your device into landscape orientation to avoid that. Verdict At $14.95, the Nest is a must-have accessory for your iPad. Whether you have the first generation iPad, or the new iPad, the Nest will be a useful accessory. It's a display stand, a typing stand, and a valet for your small items. You can't go wrong with this one. For more information, color options, and ordering information, visit Bluelounge. Was this review helpful? What kind of stand do you use for your iPad?